. 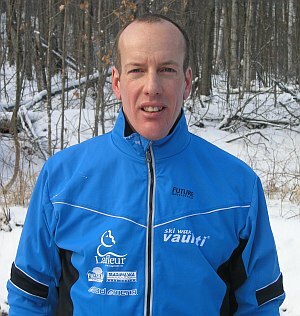 : Wayne Dustin :: Ski XCOttawa.ca :: Skiing in Ottawa and Gatineau Park :. If you're ever out early in the morning in the Gatineau Park, and you see one lone, giant set of skating tracks on the freshly Lafleur-groomed parkway, chances are it's Wayne, putting in the hours before work. When Wayne was growing up as a boy in Sault Ste. Marie, people noticed two things about him: one, that he had really skinny calves, and two, that he was really fast. He was quickly on the National team, and proceeded to race at two Olympic Games, in Calgary and Albertville. He also has an Ontario University record for wins - he didn't lose a race in the Ontario circuit for six years. During that incredulous streak, Wayne was awarded a Master's degree in Computer Engineering, and shortly thereafter managed to land a job at March Networks out in Kanata. The inexorable draw of that soul-sucking suburb (just kidding Kanata-ites) has just enticed him into buying a house there. Wayne is also the proud father of Kaitlin, born November 18th, 2006. Along with these important personal accomplishments, Wayne completed his first Ironman triathlon in September, in Wisconsin - after training for four months! Wayne is a real fountain of ski knowledge, and a truly valuable asset to XC Ottawa - we hope that, despite the new house and the new kid, he will continue to be the most reliable source of early-morning trail reports. Performance Goals: Top 10 Keskinada 2007.